First round leaders Victoria Kings will enjoy home advantage when the second-round of the Stag Beer sponsored East Demerara Football Association (EDFA) senior league kicks off at the Victoria ground, East Coast Demerara from 16:00hrs Sunday. The Kings, once a formidable team in Guyana carrying the brand of knock-out kings, will be seeking to maintain their winnings ways having lost just one of their seven games while also drawing one to accumulate 16 points. They will lock horns with BV Triumph United in the feature game under lights. The BV side is occupying the fifth place of eight in the points standings on 10 points from two wins a similar amount of draws whilst losing thrice. All the teams would have sought to regroup and reassess their performances in the first round with a view to correcting mistakes and strengthening for this second and final round. 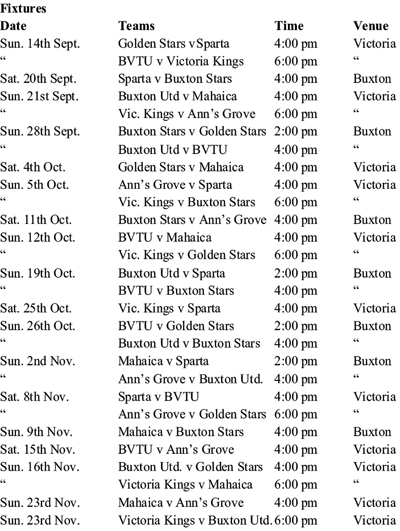 Sunday’s opening fixture will see the sixth placed Golden Stars taking on bottom of the table Sparta United from 16:00hrs. Following is the latest points standing. Kindly note that a goalless draw will see each team credited with a point each while draws with goals attracts two points each.